Purchase this product now and earn 150 - 150 Points! There are menthol e-iquids and then there are sensational menthol flavours. 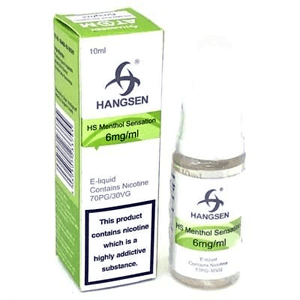 Hangsen Menthol Sensation is possibly the iciest juice of them all, the ice queen of e liquids with a positively glacial finish that you simply have to experience if you appreciate a great menthol vape. We are not talking sub-zero here. The finish on this one is more absolute zero! If you love your menthol you are going to worship this e liquid. It delivers a veritable explosion of refreshing menthol that blitzes your taste buds and leaves them wondering what hit them. But you will still want to come back for more!